Christian author, speaker, and radio talk show host Eric Metaxas has become a leading evangelical voice in our day. He entered the national consciousness with a direct message a couple years ago at the National Prayer Breakfast. I was deeply impressed by his book Amazing Grace, which painted an inspiring portrait of British statesman William Wilberforce, the man who successfully led the fight against slavery in the British empire. Mextaxas also gave a stirring and insightful message to the Oxbridge Conference a year ago, an event sponsored by the C. S. Lewis Foundation. I was not there in person, but the YouTube video is available, and I highly recommend it. When Mextaxas speaks, he mixes serious commentary with a wry sense of humor that carries his points well. 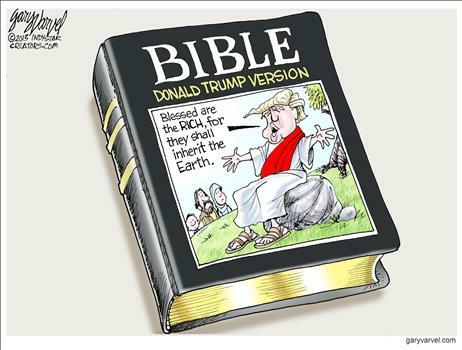 That sense of humor has surfaced lately in his responses to Donald Trump. 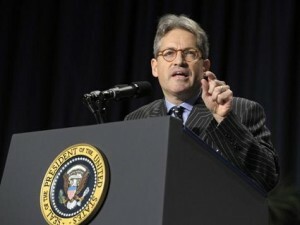 When Trump declared the Bible was his favorite book but then wouldn’t (or couldn’t) come up with a single verse that had impacted his life, Metaxas developed what he calls “The Trump Bible.” He has been posting an ongoing series of verses in the way that Trump might want them to appear in Scripture. And Jesus went out into the desert. But he should’ve invested in hotels there. I mean, I’m killing it in Vegas. A LOT of money. Love covers a multitude of sins. Sure. But you’d be nuts not to get a prenup. I mean, c’mon. Nathan said to David, “You are the man!” And David said, “No, YOU are the man!” And they high-fived each other. It was fabulous. Sarah lived to be a hundred and twenty-seven years old, but even young she was nothing to look at, so you can just imagine. You’ve heard it said, “An eye for an eye and a tooth for a tooth,” but I say unto you, that’s lousy negotiating. Why break even? Moses saw that the bush was on fire but was not consumed, because, face it, the bush was low-energy. I know a man who was caught up into the third heaven… Who’m I kidding? You knew it was me, right? Paul? He’s ok…but I like missionaries who don’t get shipwrecked and jailed! Nebuchadnezzar was the best. I mean, he built a giant golden statue of himself. He is an inspiration to me. On the other hand what did John the Baptist really do? Announced one Messiah? One? Are we serious? Humor. Sometimes it makes the case better than a serious critique.